Are homeschool bumper stickers a thing? I can’t say that I have ever noticed any while out driving. I’ve never felt the need to let all of Interstate 35 know we are a car full of truants on our way to the movie theater at 11am on a Tuesday. Still, if you know what you’re looking for, you can spot a homeschool family automobile with ease, no label required. Big van/SUV vibrating with kids of multiple ages (boldly roaming the roads and crashing quiet coffee shops during regular school hours) stuffed to the gills with audio-books, snacks, and intelligent debate. Matching socks and combed hair optional. I often wonder what the mathematical correlation is between cars with politically snarky rear ends and vengefully keyed car doors and fenders? No matter the reason for the bumper sticker, you can get a good sense of the species and temperament of the driver you are barreling dangerously close to at 75mph. In a few sticky words you might know if you’re breathing the electric exhaust of a tree hugging cat lover, or the diesel debris of a pistol packing meat eater. How immature and cathartic was that daydream? I totally cracked myself up, and began “laughing out loud” for real. Not the phony social media kind (LOL). The kind of crazy donkey laugh you get after a particularly trying day homeschooling three grumbling boys and then driving them across the county for lessons and practices. It’s the kind of laugh that made the boys get quiet in the backseat and look alarmed. Maybe mom had finally cracked over their backseat head bopping game. I don’t know. But I couldn’t stop! The rest of the evening I was lost in my head brainstorming more silly quips a homeschool family might slap upon their bumper and then go and strategically park next to a proud mini-van sporting the tag of an honor-roll student. Just for fun. 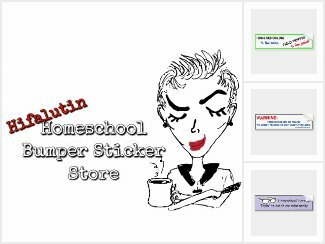 Want a sticker for your homeschool bus? 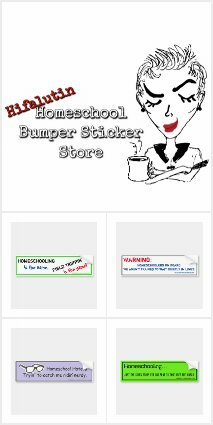 Check out the Homeschool Bumper Sticker Store! Need more reasons to sit back and laugh about life as a homeschooler? You have got to read my new book! 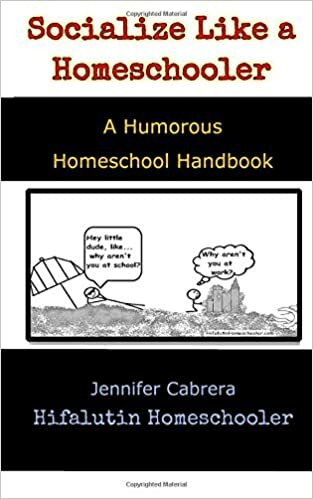 Cover to cover cartoons, laughs, and inspiration for the whole homeschool family! Thanks for the laughs! This isn’t exactly homeschool related, but I hear some moms who drive smaller vehicles get bumper stickers that say “I will never drive a minivan.” I really want to get one of those for my 12 passenger van.